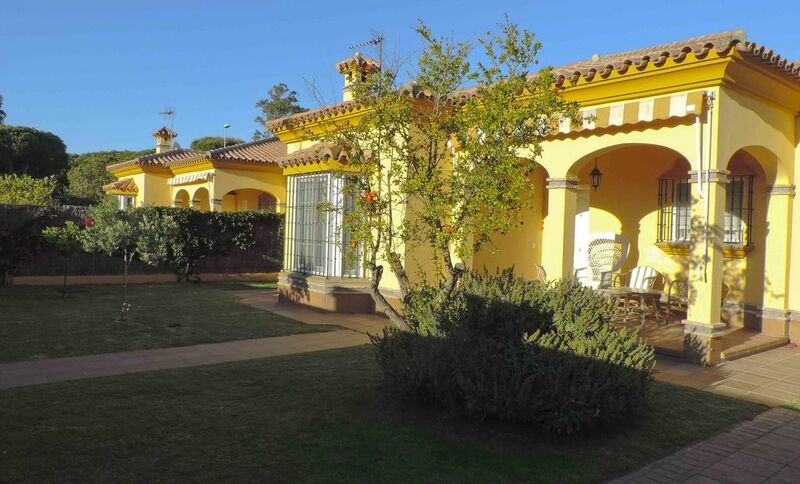 Villa with private pool very close to La Barrosa beach (Chiclana de la Frontera). The ideal choice for a family holiday with everything close at hand. The house has a capacity for up to six people, and has three bedrooms and two bathrooms, The master bedroom has a double bed and bathroom, and the others have two single beds each. The living room with TV and sofas, and the kitchen is fully equipped with everything you need for your stay, with an oven, microwave, dishwasher and all utensils. The accommodation has a large private garden with two porches and a private pool available in the summer months, perfect for spending the days relaxing. There is also private parking and Wi-Fi internet connection. Pets are welcome to come on holiday with you to this villa. The location is perfect, only two minutes by car from the beach and five minutes from the amenities of the town. With easy access to the main roads in the area. Near the house you can find a Mercadona supermarket, about four minutes´ drive away. Extremely dusappointed. Will not book with you again! La casa muy limpia y el entorno. La casa estaba muy fría, aunque hay 3 radiadores portatiles está muy fría y húmeda.